In addition to impressive guide number of 18 with ISO 100 film. The macro ring flash mounts onto the front of a lens, the standard ring size is 52mm. • Digital macro auto ring flash. • Ring Adapters Included: 52, 55, 58, 62mm. 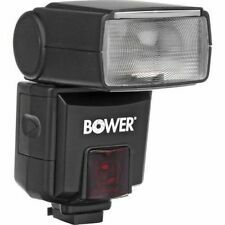 The Bower Digital Professional LED Video Light provides elite lighting efficiency for your photography and videography needs. The Digital Professional LED Kit performs admirably even in low-light situations. Bower SFD490 Digital Automatic Flash. Warranty Bower 1 Year. Flash Output Automatic with variable F/stop setting. Type Universal Auto flash. Flash Duration 1/200-1/20000 sec. NiCd or NiMH. Flash Ready Indicator Yes. It has a guide number of 125 feet (38m) at ISO 100 (85mm). It also includes a built-in diffuser and bounce card for added lighting effects. Bower Autofocus Dedicated i-TTL Power Zoom. Warranty Bower 1 Year. It also has an automatic zoom range of 24-105mm to optimize the beam angle to your lens. Along with this, the SFD5400 can tilt upward 90° and rotate left 180° and right 90°, ensuring you can get the light to fall exactly where you need it. With a guide number of 148' at ISO 100 and 105mm this unit is quite powerful and will easily illuminate your scene. It features a zoom range from 24 to 105mm along with the ability to tilt up to 90° and swivel 270°. Brand new! Fast Free Shipping! This allows for accurate exposures of closeup subjects. TTL Dedication Yes. Type Flash. Modeling Light No. Side Wings No. 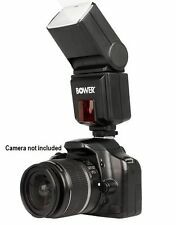 BOWER DIGITAL AUTOFOCUS DEDICATED FLASH for SONY ALPHA & NEX SFD550NEX. Shipped with USPS Priority Mail. Bounce and swivel zoom head allows versatile reflection for difficult lighting conditions. Automatic zoom coverage for 28mm - 85mm. Auto power saving. Auto check indicator. Fast recycling IGBT circuitry. The SFD740C is notably lightweight at only 7.8 ounces and has a quick flash duration of 1/700 second at full power. An AF assist light is built into the unit and can reach up to 26' away to help you autofocus in low light situations. Compatible with Canon EOS T7i T7 T6i T6s T6 T5i T4i T3i T2i T1i T5 T3 XS. Flash ready indicator in viewfinder. Full digital TTL dedication. Autofocus Infra-Red assistance beam, Accepts alkaline, lithium and Ni-MH batteries. 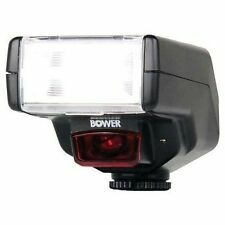 Bower SFD680 Shoe Mount Flash for Nikon. Condition is New. Shipped with USPS Priority Mail. 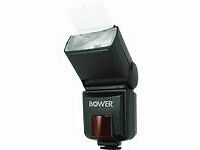 Bower Electronic Flash in Box. TTL Dedicated/ Auto Focus. This Flash is in Excellent condition with little to no signs of wear. 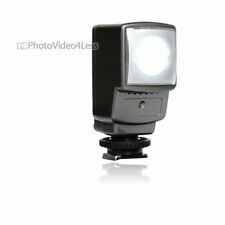 This flash works with the Minolta and Sony Alpha (A-mount) lenses. 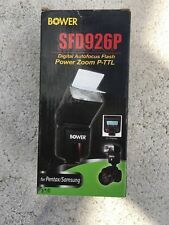 Bower flashgun for Sony DSLR cameras, new in opened box, works perfectly. Bower SFD35S Dedicated Flash PTTL. Sony PTTL / ADI. Flash Duration. Vertical 45 degree. Horizontal 60 degree. Angle of coverage. 100- 300 per set of batteries. Number of flashes. Bower SFD35S Digital Flash. The SFD35S has an infra-red focus assistant beam which provides illumination under low lighting or complete darkness. A100 A700 A200 A300 A350 A230. Pro Series Dual Shoe Right Angle Flash Bracket w/Horizontal & Vertical Position. As seen in photo. Has had very light use. Box is slightly worn. 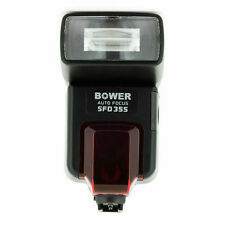 Bower SFD35C Digital AF Dedicated Flash For Canon EOS. Warranty Bower 1 Year. Zoom Range 0-90 degree. Angle of coverage 75° - 28°. 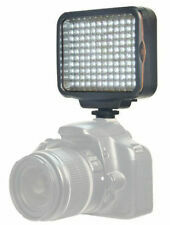 Type Dedicated shoe-mount e-TTL flash. Flash Duration 1/700 sec (full output). Flash ready indicator in viewfinder. Full digital TTL dedication. Autofocus Infra-Red assistance beam, Accepts alkaline, lithium and Ni-MH batteries. Auto standby after 3 minutes. Red Eye Reduction. Flash & Lighting. Computers & Accesories. Binoculars & Spotting Scopes. Batteries & Power. Bags & Cases. Albums & Storage. 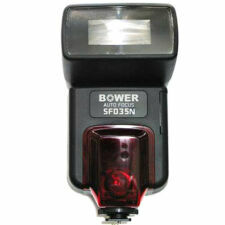 Bower SFD490 Digital Automatic Flash For any Canon. Warranty Bower 1 Year. Type Universal Auto flash. Flash Output Automatic with variable F/stop setting. Flash Duration 1/200-1/20000 sec. NiCd or NiMH. 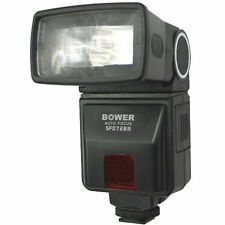 Bower Dedicated Autofocus Flash-Canon E-TTL I/II that is new and sealed. Can zoom, bounce, and swivel head. This is the most it will be. 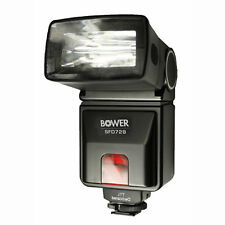 BOWER SFD728S DEDICATED FLASH FOR SONY, NEW IN THE BOX. We want you to be happy. You are responsible for them, and we do not know how much they will be. Flash Duration: 1/1000 second. IF YOU BUY THIS FOR ANYTHING OTHER THAN SONY IT WILL NOT WORK! Flash coverage up to 3x optical zoom. Swivel Angle: 0-330 degrees. Bounce Angle: 0-90 degrees. It's nice to know what you are buying and from whom.